Transient figures and intangible forms dwell in the work of Enrico David. They retain a graphic quality as they transition from spontaneous sketches on paper to paintings, sculptures, and works in other mediums. This exhibition, David’s first solo presentation in Los Angeles, takes its cue from a singular figure modeled in bronze around a hollow animal bone and bound to a protruding blade. The statuette is like an anthropomorphic pocketknife that embodies both permanence, through its molded outlines, and ephemerality, through its gaping cavity. Around it, paper mummies crawl across the wall of the gallery, a haunting silhouette peers out of a large canvas, and ethereal profiles form a see-through metal screen. The infinite shifts and vortexes of David’s underworld are evoked in the streaming lines of his drawings and the repetitive loops of a handcrafted tapestry. Experienced together, the works in this exhibition evoke the continuous metamorphosis of body and soul. Groundless images and vacuous gazes exude a sense of unease in the visitor, who is at once observer and participant in a staged scene. Its components recall the miscellaneous displays of regional arts and crafts museums, but they could also be props for a Surrealist set. 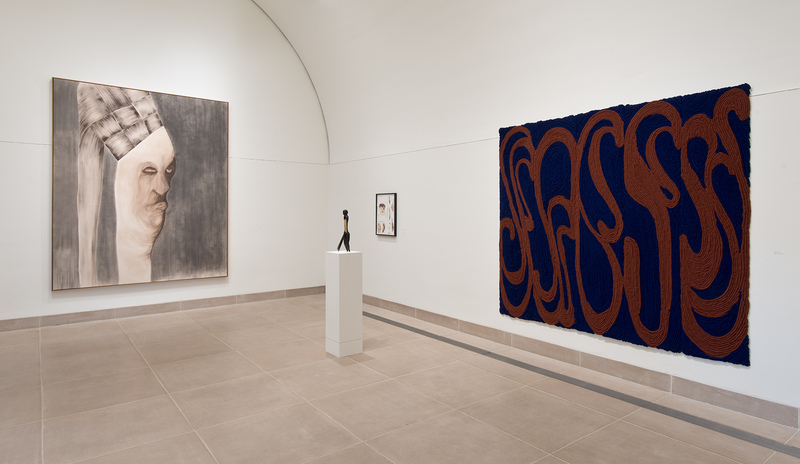 Hammer Projects: Enrico David is organized by Allegra Pesenti, curator, Grunwald Center for the Graphic Arts. Enrico David was born in Ancona, Italy in 1966. His work has been the subject of numerous one-person exhibitions at venues such as the New Museum, New York (2012); Museum Für Gegenwartskunst, Basel, Switzerland (2009); the Seattle Art Museum, Seattle, Washington (2008); ICA, London, United Kingdom (2007); the Stedelijk Museum, Amsterdam, The Netherlands (2007); and Tate Britain, London, United Kingdom (2005). David’s work has been featured in group exhibitions including Secret Societies, Schirn Kunsthalle, Frankfurt, Germany and CAPC Bourdeaux, France (2011); Turner Prize 09, Tate Britain, London, United Kingdom (2009); Textile Art and the Social Fabric, Museum van Hedendaagse Kunst, Antwerp, Belgium (2009); Italics: Italian Art between Tradition and Revolution 1968-2008, Palazzo Grassi, Venice and Museum of Contemporary Art, Chicago (2008); Tate Triennial, New British Art, Tate Britain, London, United Kingdom (2006); Flesh at War with Enigma, Kunsthalle Basel, Basel, Switzerland (2004); and Dreams and Conflicts, Venice Biennale, Venice, Italy (2003). Enrico David lives in Berlin, Germany. 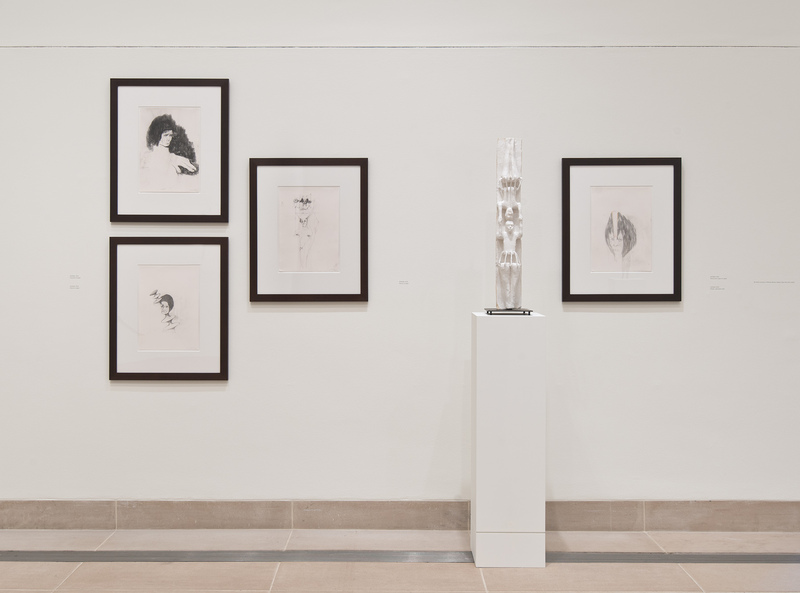 The small space at the Hammer Museum known as the Vault Gallery is an appropriate setting for Enrico David’s mutable figures and forms. It was designed to house a rare manuscript by Leonardo da Vinci, which was unofficially named the Hammer Codex after the museum’s founder acquired this Renaissance work in 1980 (1). 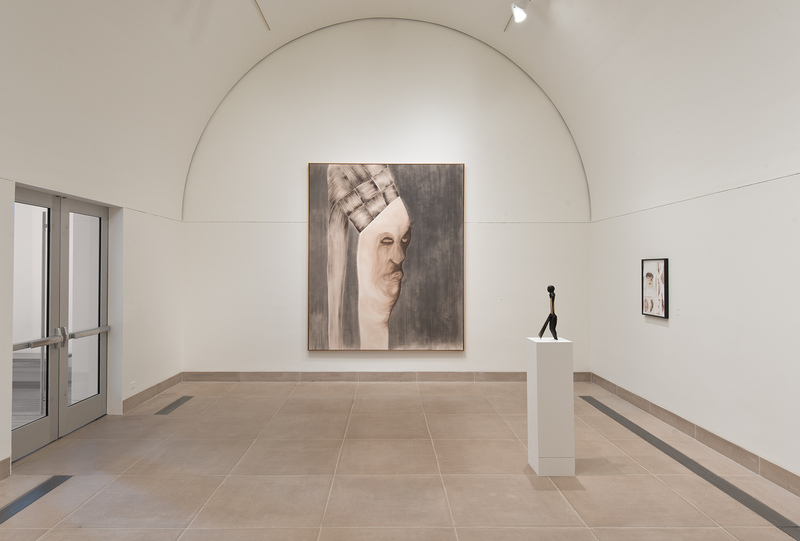 The gallery’s arched walls and cavernous quality are now ghostly reminders of its original function, yet the room is like a deconsecrated chapel that continues to tease the imaginations of artists and curators (2). The architectural memory of the space, as well as the eerie absence of the object that it was conceived for, make it particularly compatible with David’s investigation of the theme of passing. David alludes to the current installation as being detached from narrative and moving instead toward the rendition of an overarching feeling, likening it to the less definable assimilation of the senses experienced during a mass (3). His description suggests a temporary memorial, like those sites of spontaneous ceremony that, as defined by Erika Doss, can be considered repositories of emotions or “a public archive of feelings”(4). David’s imagery and choices of mediums evoke the transience of memory and the impermanence of such commemorations. A see-through screen mounted in steel delineates three profiles that march on curved legs toward the unknown. Paper silhouettes—or “mummies,” as he refers to them—crawl precariously along a wall like furtive prey. A large portrait of an androgynous figure extends elastically across the canvas, yet it could slide off at any moment. Its timeless features recall at once a Renaissance nobleman, an Asian warrior, and, according to the artist, “a bloodless turd so evolved as to wear its own expression of disgruntlement.” Two bodies hold onto each other in a columnar plaster sculpture, head to head, as if to protect themselves from each other’s vertigo. In reality it is a single body, as David explains, “clinging to its own distorted mirror image, its core replaced by what appears to be a metal cage, a rudimentary washing machine component perhaps, or a place for the kitten inside.” His forms are fleeting, like memory itself, which Doss interprets as being “valorized for refusing to ‘stand still’ . . . for being elusive and unstable, open-ended and unresolved”(5). A sense of urgency, or what he calls “an impulse to implode,” transpires in the execution of David’s works. They can be mysteriously evasive, but they are not devoid of role and integrity. Here they seem to respond to the artist’s cerebral quest for the understanding of the state of the human body neither in life nor in death but rather somewhere in between. One thinks of Michelangelo’s depiction of Saint Bartholomew in the Sistine Chapel, in which the saint hovers near Christ as the souls of the deceased rise to heaven or descend to hell. In this tremendous interpretation of the Last Judgment, the soul may be transported to an unknown world, but it is still bound to its physical embodiment, even when the physical being is transformed, as it is in Saint Bartholomew’s flayed skin (the symbol of the saint’s martyrdom and in Michelangelo’s rendition supposedly a self-portrait of the master in decay). The central figure and metaphoric anchor of David’s installation is, like Saint Bartholomew, disembodied and bears a knife. David offers a quotation: “Like the surgeon, the [composer] slashes open the body of his fellow man, removes his eyes, empties his abdomen of organs, hangs him upon a hook, holding up to the light all of the body’s palpitating treasures, sending a burst of light into its innermost depths”(6). Modeled in bronze around a hollow animal bone and bound to a protruding blade, David’s sculpture encapsulates matter in its molded outlines, but it also conveys the disintegration of matter through its gaping cavity. Have its entrails been transposed to the tapestry hanging nearby? The thick tubular components and deep tones of the woven piece are certainly suggestive of moving flesh and bodily fluids. Here, from piece to piece, David alludes to the tangible and intangible stuff of the human figure and to its contained and uncontained interiors. Aristotle states that memory “is like the imprint or drawing in us of things felt.”7 Drawings are indeed a form of fixative for the mind. Leonardo invented the sketch to capture thoughts on paper as spontaneously as they arise in the head, and thereafter the combined acts of thought and draftsmanship formed what Giorgio Vasari defined as disegno, which he regarded as the basis of all arts.8 The Vault Gallery’s leap from Leonardo’s codex, with its studies and notes on the movement of water, to the current presentation of Enrico David’s graphic world is perhaps not as great as one might imagine. Drawing and movement are at the core of the current installation just as they were when the leaves of the Renaissance codex were displayed in the space. A web of pencil lines streams toward the center of one of David’s sheets, where they meet the head of an eyeless fairy. His work is rooted in line, and he retains the impulsive and ephemeral nature of drawing as he transitions from sketches on paper to painting, sculpture, and other mediums, often reverting back again to drawing. In one of his more haunting renditions, a face is modeled in wax over wiry features traced in pencil and barely visible beneath the glutinous skin. A puzzle of muscular forms washed onto strips of paper alludes to a dismemberment of the body. Here drawing and sculpture collide and together enable David’s mutation of form. The artist likens his diverse compendium of objects to the displays at regional ethnographic museums in his native Italy. No dust will settle on his imaginary archive, however, as its contents are on the move and forever in metamorphosis. It too is passing by like the Leonardo codex before it, like the temporary pop-up memorials of modern society, and like David himself, who belongs to today’s generation of diasporic artists—Italian-born, educated in the United Kingdom, resident in Germany. For now, David’s specters find harbor in a space where they can comfortably inhabit its memories and commune with its spirits. Epigraph: John Mack, The Museum of the Mind: Art and Memory in World Cultures, exh. cat. (London: British Museum, 2003), 149. 1. The codex had been in the collection at Holkham Hall since 1717, when it was acquired by Thomas Coke, the first earl of Leicester. Sale, Christie, Manson & Woods Ltd., London, December 12, 1980. 2. The codex was sold at auction in 1994; see The Leonardo da Vinci Codex Hammer (New York: Christie, Manson & Woods International, 1994), with a foreword by Richard Turner and text by Carlo Pedretti. It was purchased by Bill Gates. 3. Enrico David, conversation with the author, Milan, November 2012. All quotations from the artist in this essay are from this conversation. 4. Erika Lee Doss, The Emotional Life of Contemporary Public Memorials: Towards a Theory of Temporary Memorials (Amsterdam: Amsterdam University Press, 2008), 11. 6. From the booklet accompanying Fantômas's album Delìrium Còrdia (2004) paraphrasing the surgeon and author Richard Selzer’s introduction to the photographer Max Aguilera's book The Sacred Heart: An Atlas of the Body Seen through Invasive Surgery (Boston: Little, Brown, 1997). 7. Aristotle, quoted in Adrian Forty and Susanne Küchler, eds., The Art of Forgetting (Oxford, UK: Berg, 1999), 4. 8. See Martin Kemp and Margaret Walker, eds., Leonardo on Painting: An Anthology of Writings (New Haven, CT: Yale University Press, 1989), 19, and Giorgio Vasari, Le Vite de’più eccellenti pittori, scultori e architettori nelle redazioni del 1550 e 1568, ed. R Bettarini, annot. P. Barocchi (Florence: Sansoni, 1966–87), vol. 1, 111. Hammer Projects is a series of exhibitions focusing primarily on the work of emerging artists. Hammer Projects is made possible by a major gift from The Horace W. Goldsmith Foundation. Generous support is provided by the Los Angeles County Board of Supervisors through the Los Angeles County Arts Commission and by Susan Bay Nimoy and Leonard Nimoy. Additional support is provided by Good Works Foundation and Laura Donnelley; the City of Los Angeles Department of Cultural Affairs; the Decade Fund; and the David Teiger Curatorial Travel Fund.